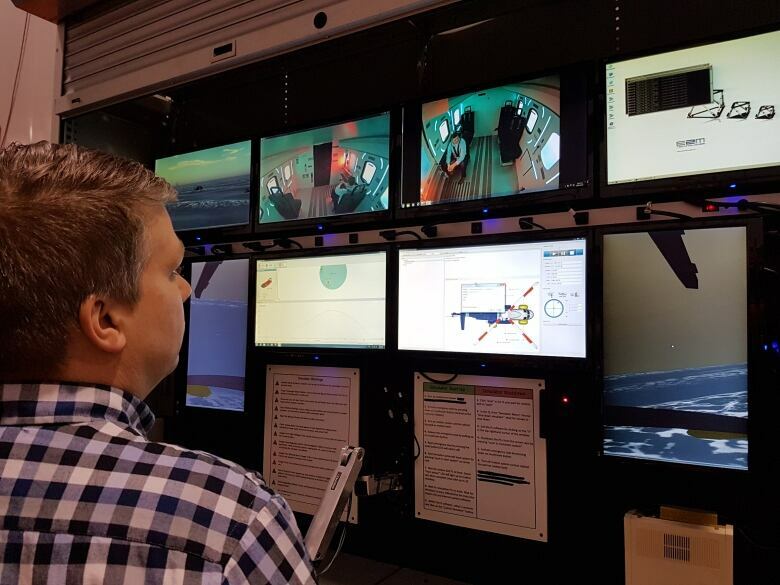 A St. John's company and the Marine Institute are collaborating on a helicopter simulator they hope will better prepare offshore workers for emergencies in the air. Imagine you're an offshore worker on a helicopter flying to an oil platform and you hear the words "prepare to ditch" from your pilot. Adrenalin surges through your body as you raise your arms across your chest and assume the brace position. But will you remember what to do? Will panic take over? 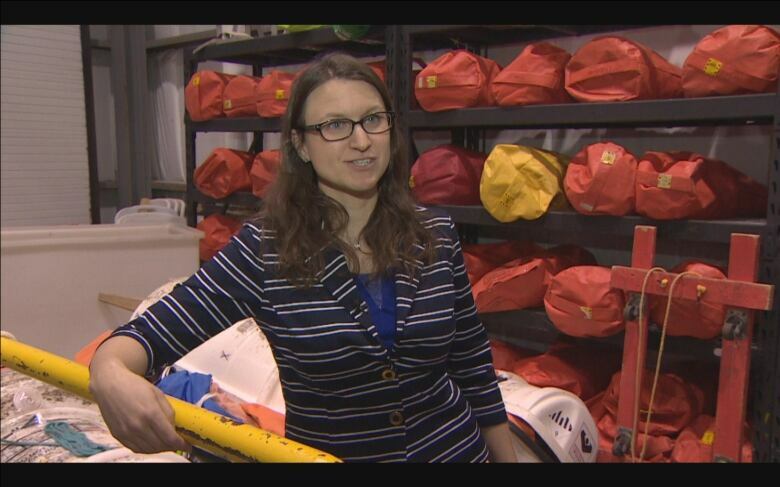 A St. John's company is working with the Marine Institute to help offshore workers become more comfortable in the air and better prepared for emergencies. Ten years ago, in the days after the crash of Cougar 491, Anthony Patterson began thinking about how to improve safety in the offshore. 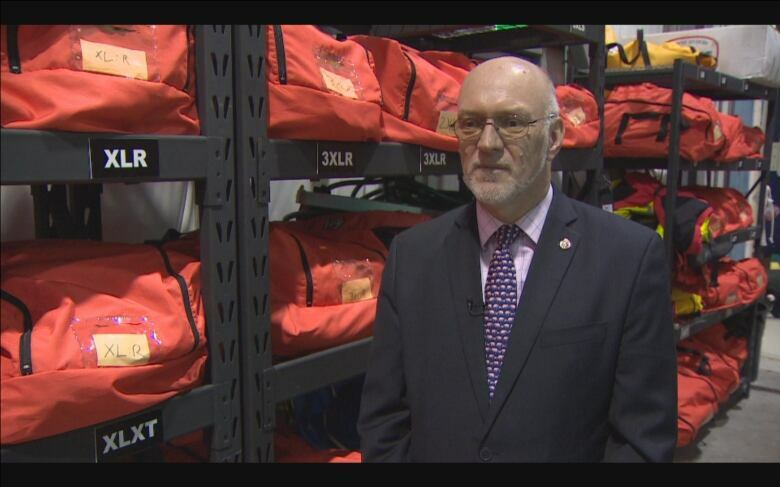 His company, Virtual Marine, was in the early days of developing simulators for lifeboat training in the water. But Patterson, whose team specialized in marine simulations, knew his company had some technologies that could apply to the air. "We brainstormed on how we could create a better training experience," said Patterson, and they developed a small helicopter simulator. "We're very good at modeling boats in the water and then even the helicopter floating in the water, but the part about the helicopter flying through the air, of course, we had no expertise with that whatsoever," said Patterson. That's when Cougar Helicopters got on board. 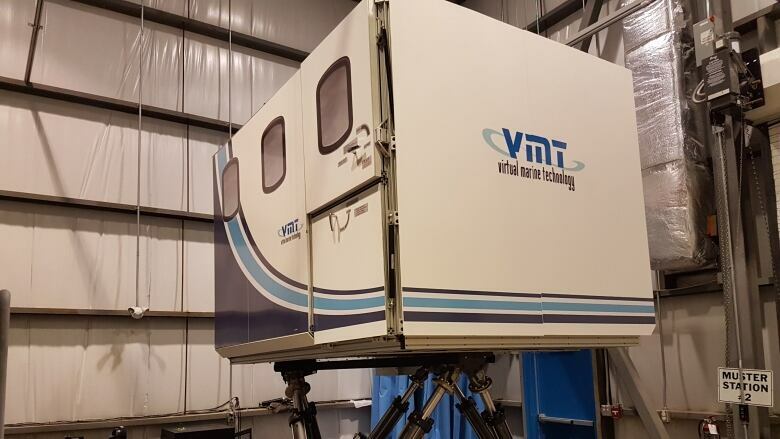 Virtual Marine brought its helicopter simulator to the lead pilots at the company. With the simulator, they flew the different kinds of manoeuvres they'd use if they had to ditch at sea. The simulator collected the data. and Virtual Marine embedded it into their simulation system to create the flight paths in an emergency. The simulator consists of a large box made to look like exactly like the inside of a helicopter. A motion bed, attached to the underside and controlled by a computer, allows workers to feel the same kind of movement as they would during a flight. The seatbelts are the same, the windows are the same and the views out the windows are the same as they would be in real life. It's important that the simulator be as realistic as possible for Liz Sanli, a researcher in ocean safety at the Marine Institute with expertise in skill learning over time. 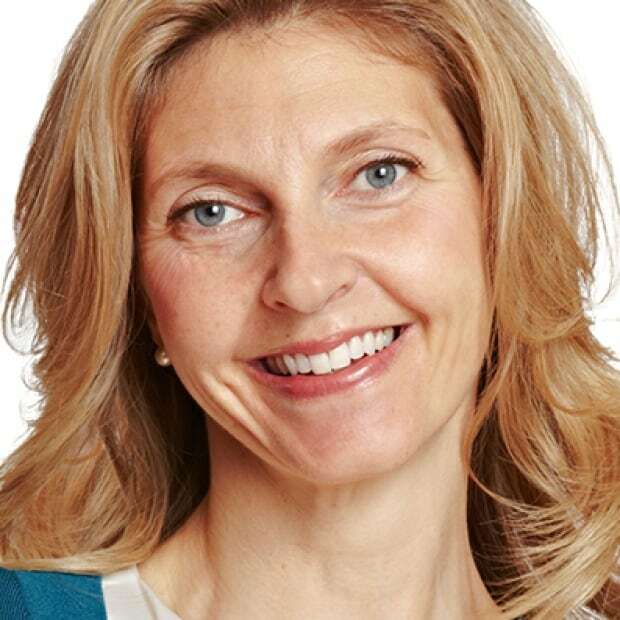 She's focused on how workers learn and how much they retain when asked to perform a task again at a later date. "So we're looking at how we can train during practice to help them remember all those steps when they're in a stressful situation down the road," said Sanli. Right now, workers are trained in a swimming pool on how to escape a helicopter submerged in water but training for the actual flight occurs in a classroom. 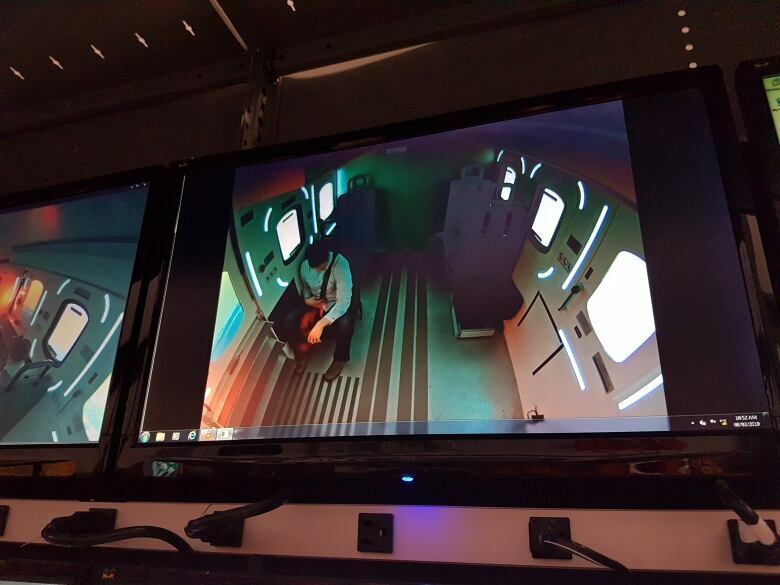 By sitting inside a helicopter flight simulator, Sanli says, the workers' experience is more accurate. "You're getting that experience of physically doing the task so you get to go through the steps you get to experience them you can sometimes experience mistakes in a safe environment and learn from those mistakes rather than just watching somebody else do it, for example," said Sanli. "You also can simulate some of the feelings, so you can hear the sounds, you know that you're in a different environment and that can better match some of the more advanced training or perhaps even a real emergency." Sanli measures anxiety levels of participants and follows how well the protocol sequence is followed under a variety of conditions. She monitors what happens when trainees are seated in different positions and when they train in light and in darkness, getting as much information as possible to make training efficient and effective. "It's a big responsibility to have this evidence to make decisions when it comes to regulations, when it comes to decisions about training to have it based in evidence. It's safety that's at stake," said Sanli. For now, research on the simulator continues with hopes it will soon augment the training done by offshore workers. Patterson,says ten years after 17 lives were lost in the offshore, he's glad to have contributed what he could to try and make the industry safer. "This really was something that was more than a job," he said. "It was something that we had to do, to do our part to bring safety to the community. Everybody in the company, we all worked extra hours. I'd say this is the one that all of our engineers have the most pride in, accomplishing this task."